The snowy, wet weather of the Northeast left me been craving a creamy, delicious pasta to warm my toes. However, with hours to spend inside, I got creative and veered away from a traditional Alfredo by adding a few seasonal ingredients. Hothouse spinach and Meyer lemon zest jazz up this classic and make it slightly healthier. 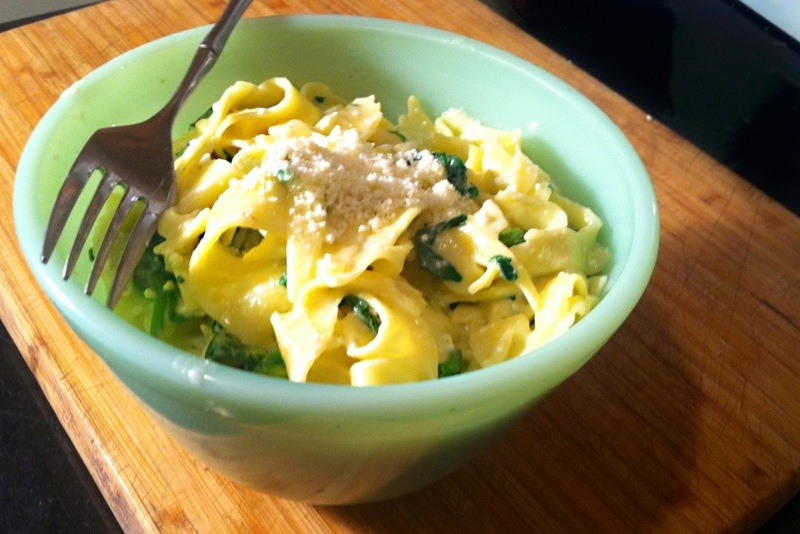 Though fettucine is typically paired with Alfredo, I used an egg pappardelle, but any pasta you have on hand will do. Also, regular lemon will work well if you can’t find Meyer lemons and feel free to substitute the greens of your choice for the spinach. 1. Bring a large pot of salted water to boil, then cook pasta according to instructions on the package. When pasta is al dente, drain and reserve water. 2. While water is still hot, plunge spinach into water and cook for a minute until soft. Drain, then toss with pasta and return to pot. Cover to keep warm. 3. Heat the milk in a heavy skillet over a medium flame. Add in butter, stirring occasionally as it melts. When butter is melted, whisk in lemon zest then season to taste with salt and pepper. Remove from heat when sauce has thickened slightly – about 3 minutes. 4. Pour sauce over the pasta and spinach (in the pot!) and toss. Quickly whisk in Parmesan and place the pot over low heat for a minute or two until the sauce thickens to your liking. 5. Garnish with Parmesan and serve immediately.